Service Costs > How Much Does Garbage Pickup Cost? How Much Does Garbage Pickup Cost? Garbage pick-up is one of the many services that is necessary to you as a homeowner. Garbage pickup services help us take care of our garbage by coming to our homes and picking up trash, usually on a weekly basis. The cost is going to vary depending on the geographical location of your home, the amount of garbage bins you have and the company you choose. Prices for garbage collection services depend on the amount of trash that needs to be collected. The payment of this service is usually collected on a quarterly basis while the trash will be picked up on a weekly basis. For a standard 20-gallon garbage bin, the average price starts at $10 and can go up to $45 per month. Larger bins may cost a bit more. Yard trimmings can be collected as well, and this is quite cheaper when compared to regular garbage collection. Most garbage services will just charge a one time fee when yard waste needs to be picked up, and this is usually around $20 or so for a yard waste pickup. Some may also include it in your fee and will have special days throughout the month when they pick it up. For example, it could be the first Monday of every month. Most of the time, this is the case with most garbage collection companies. Tammy’s Recipes did a survey in the past and found that close to 27% paid nothing, while 20% paid $10 to $18 per month. Forum members on Hellobee.com paid anywhere from $11 per month to $65 per quarter. Some who lived in a city paid $1.50 to $3 per bag. We were able to call up some random garbage companies across the nation and came up with the quotes below for various cities. 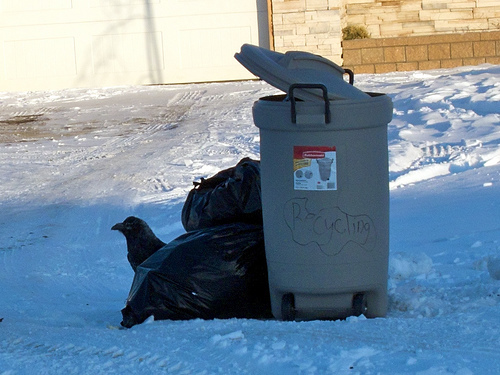 Some garbage collection companies will charge per quarter, while others may charge per month. Some cities may have its own garbage service and will tie the trash fees into your monthly city bill. Some companies, when you sign up, may include the garbage can and/or the recycling bin. Some services may allow larger pickups where they will tow away anything that does not fit into the canister. Garbage collection companies often offer the following garbage bin sizes: 20, 32, 64 and 96 gallons. Aside from residential pickup, companies may also offer recycling services, yard waste pickup, bulk waste pickup and even hazardous waste pickups. Waste Management even offers food and organic waste pickup. Large items that may not fit in the bin will have to be collected on an appointment basis. The price of disposing of larger items will depend on the size of the item and the amount you have. For example, a couch may cost $75 to have removed from the curb. Some companies may not do large collections, and this is when you will have to call up a specialized company. Most of the time, you will pay by the yard. Recycling is going to cost extra since many garbage companies do not offer this service or charge it as an add-on. Some companies will include the first garbage can for free, but others may require that you purchase your own. This is all up to the company’s policy. While companies will include the initial bin, most will charge for an additional one. These fees can start at $5. A one-time setup fee may apply to new accounts. This should be less than $50. Make sure that you subscribe to a plan that is sufficient to your needs. Do not pay for two cans per week if you only have to fill one. Check with your homeowner’s association if you belong to one. Some will pay for your trash as part of your fees. Most cities have their own services that are tied into your taxes. Check with your local city to see if they are included. Before signing up for a major trash hauler such as Waste Management or Advanced Disposal, see if there are any promo codes and/or coupons available. Since most of these companies require you sign up for a quote through the Internet, you may be able to input a code to save money on your first bill. $80.40 every 3 months for a weekly pick-up of one garbage can but were also supplied a garbage can for recycle materials and one can for lawn and brush clippings. The $80.40 was for the garbage pick up only the other two cans were free. There was only one problem with this, sometimes there was not enough garbage for 2 people to even bother putting the can out. But did like the idea that they collected recycle materials for free and supplied the can. I’m looking for something cheaper. Hopefully just pay per bag. The amish use mine at night when they feel like it. $18 per month for garbage pickup and occasional leaf/limb pickup. Every household pays the same rate regardless of how much trash is left curbside. Does not include recycling or trash can. Workers throw cans and tore up every one I bought was torn up after first use. They recently switched to providing heavy duty cans that can be picked up by arm on truck. Still no recycling. The service provider has petitioned the Public Service Commission to increase rates to $32 per month.